Why are disadvantaged children and adults disproportionately likely to experience attention disorders, chronic stress, and health problems? For more than a century, the nature/nurture debate has found unsatisfactory explanations, often casting blame on more vulnerable populations. Dan Keating’s book Born Anxious shows promising new research that transcends the nature/nurture stalemate and contains implications for many of us. It turns out that significant stress, particularly early on, can change a genetic process called “stress methylation,” affecting us for life. Nurturing seems to be able to ameliorate or reverse this process. Anyone exposed to substantial prenatal or early childhood stress, without comfort, is at risk. Future generations may also be at risk: while this epigenetic change is not tied directly to DNA, it can be passed on in utero. Keating and colleagues at the Human Development Program (HDP) at the Canadian Institute for Advanced Research used longitudinal data from the 1958 UK Birth Cohort to document that socioeconomic circumstances at birth have an impact throughout life, with sweeping consequences like academic problems at age 11 and health problems at age 30. They also found a “gradient effect,” meaning that the outcomes became worse at each step down the socioeconomic scale. Still, socioeconomics were a stand-in for what was really causing the debilitating changes. Animal studies showed the HDP team that a key factor was stress. Peer-raised monkeys, without parental nurturing, had an amped-up stress response, provoked quickly and slow to fade. A study of children from destitute Romanian orphanages showed that those who were not adopted into nurturing homes suffered as the deprived monkeys had, with a host of difficulties from stress to trouble forming relationships. The missing piece was introduced by Michael Meaney in his work on epigenetics, the study of changes in gene expression rather than DNA itself. In stress methylation, the gene whose job it is to chill and shut off cortisol is silenced. Through stress methylation, in-utero and early-life stress can cause a permanent epigenetic change telling the newborn, child, teen, and then adult that it’s a dangerous world out there and you better live hard. Keeping the stress system on high alert leads to numerous problems in health and development throughout the life course, and is associated with early mortality. Keating is now part of the SRC’s Population, Neurodevelopment and Genetics Program where he and colleagues study the many ramifications of and questions raised by these discoveries. His new book explains the current science on epigenetic stress changes, how they affect us as we age, how we may be able to heal, and what the implications are for our stress-permeated culture and future generations. Daniel P. Keating. (2017). 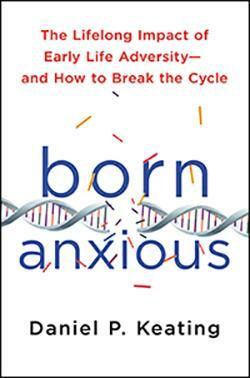 Born anxious: The lifelong impact of early life adversity and how to break the cycle. St. Martin’s Press.